Tomasz Stanko is at the forefront of international contemporary jazz trumpetism, and holds a status in international jazz circles similar to where Miles Davis was in the seventies. He is one of ECM's leading jazz recording artists, drawing large concert audiences in Europe, Australia and the USA. At the age of 67 the Polish trumpet player hits, once again, a new peak with his new Scandinavian quintet. The New Yorker recently described him as "one of the world's most original and innovative jazz trumpet players", while The Times said of the new 'Dark Eyes' album (ECM 2009): "Stanko has again made an album, where every note - and the spaces around it - are full of impact." 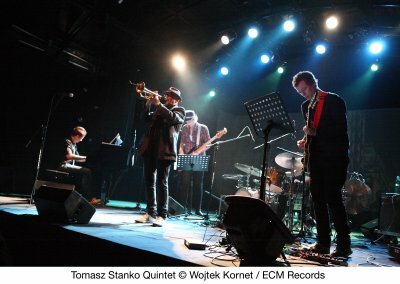 .Thrilled by Ornette, Coltrane and Miles, the young Stanko studied at the Krakow Music Academy and played the Polish underground scene with his own band, when the film composer Krzystof Komeda invited him to his quintet. Tomasz considers his five years in that band as crucial to his own style: "My lyricism and playing only the essential, my way of approaching the structures asymmetrically and many harmonic nuances are all influenced by Komeda." Stanko made 11 albums and a stack of soundtracks with his mentor. Later he has recorded many albums as the leader of various bands and collaborated with Krzystof Penderecki, Don Cherry, Arild Andersen, Bobo Stenson and especially the late great Finnish drummer Edward Vesala, to name a few. For his new quintet he hand-picked the hottest young talents on the Scandinavian jazz scene: pianist Alexi Tuomarila and drummer Olavi Louhivuori from Finland, bassist Anders Christensen and guitarist Jacob Bro from Denmark. "Stanko evokes the spirits of the finest trumpeters dead and living while creating a mood and a voice uniquely his own. Yes, you can hear the influences of Miles Davis and Chet Baker at their most introspective and profound, as well as hotter, more rasping traces of Lee Morgan and Clifford Brown... 'Soul of Things' stands shoulder to hiply-slumped shoulder with 'Kind of Blue', and has an even better sound." "Tomasz Stanko's newest release, "Suspended Night," is a masterpiece of minimalist beauty. A suite of interconnected compositions, "Suspended Night" simply numbers its "Variations" I to X. The unaffected simplicity and flexible modal structures strip down chords and melody lines to allow each of the quartet members to enter the flow with calm force or lay out with delicate understatement. At times, the melody line rests on just repeated pairs of notes -- the right ones. He is one of ECM's leading jazz recording artists, drawing large concert audiences in Europe and the USA. For two years in a row (2004 and 2005) Tomasz Stanko has won the Australian Bell Jazz Award for the best international album of the year. Stanko's latest recording Lontano (ECM 2006) features three of Poland's finest young jazz musicians, Marcin Wasilewski, Slawomir Kurkiewicz and Michael Miskiewicz, with whom he regularly performs and tours around the world. Tomasz Stanko has been ranking high in the 2005 and 2007 Downbeat Annual International critics polls’ Rising Star Acoustic Group..In the four years since the quartet's much-loved ECM debut album Soul of Things (2003), both the trumpeter and his young band have continued to make their mark. Many miles of touring, on both sides of the Atlantic, have honed their already exceptional group understanding. Their 2nd album (Suspended Night released May 2004) builds upon the conceptual framework established by its predecessor. In September’06 Lontano was released complementing the recording triology of the present Stanko Quartet. In the wake of Soul of Things, Stanko won the first European Jazz Prize, a major new award initiated by the Austrian Government and the City of Vienna. "Tomasz Stanko's release, "Suspended Night," is a masterpiece of minimalist beauty …Stanko and quartet outcool the coolest of the late '50s jazz groups and make it easy to see why he was awarded the first European Prize in jazz last year ." - The Japan Times'04. “Stanko evokes the spirits of the finest trumpeters dead and living while creating a mood and a voice uniquely his own"
He is one of ECM's leading jazz recording artists, drawing large concert audiences in Europe and the USA. For two years in a row (2005 and 2005) Tomasz Stanko has won the Australian Bell Jazz Award for the best international album of the year. The quartet has worked together regularly since last year's equally intricate release, "The Soul of Things." They let the rhythm drift into comfortable stillness, but aren't shy to drive ahead either, letting individual notes resonate freely. Still based in Poland, Stanko and quartet outcool the coolest of the late '50s jazz groups and make it easy to see why he was awarded the first European Prize in jazz last year." The Japan Times/2004.